This is a great place to sit and relax. With four good size windows and a roof that is possibly the most attractive modern structural change in summerhouses we have seen for some time, there is a good feeling about this building. Tongue and groove cladding throughout make for a very tough construction. 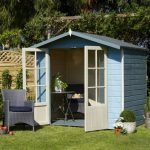 You might also like to see the top 20 small summer house currently on sale in the UK by visiting the WhatShed small summer house awards league table. 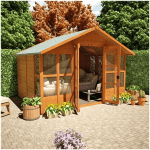 This delightful sunroom summerhouse measures up at 246.2 cm in width and 272.8 cm in depth. This changes a little as you enter the building due to the materials being used to make it, and the width reduces to 234.4 cm internally, while the depth goes down to 241.4 cm. The first thing you will notice when you see the building is the roof design. It looks fantastic, and has a curved effect that will do wonders for removing rainwater. This design is therefore not only aesthetically pleasing (and very modern) but also incredibly useful too. 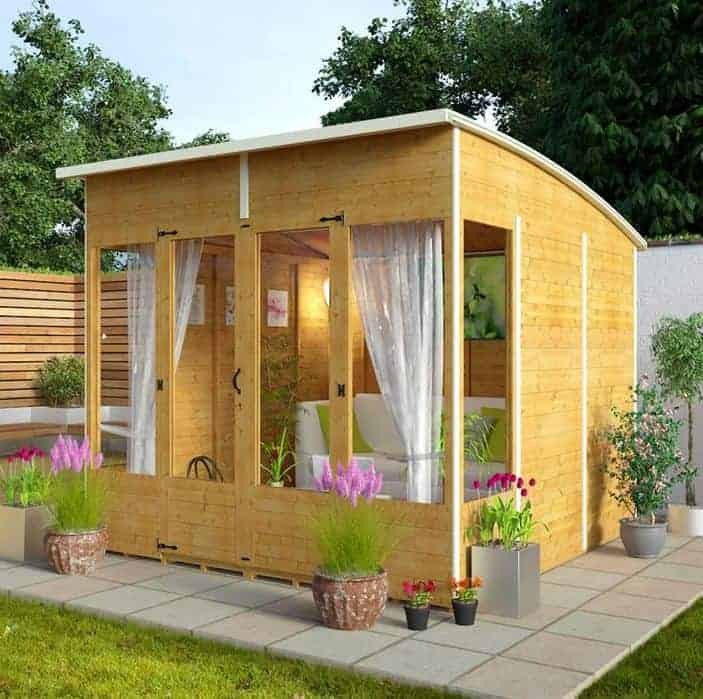 The roof is crafted from strong plywood panels, and this provides a quality level of protection against rainwater. We can’t go too over the top here on the looks of that roof. It presents well, and has that modern look that really helps to set the building apart from anything else in the garage (or indeed your neighbourhood). Striking and useful too, we see it as being the standout feature of the construction. There is an exceptional level of quality here too. 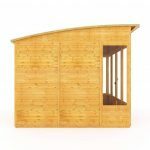 The cladding is tongue and groove, and this makes for a very strong and very effective piece of cladding. Tough enough to keep rainwater out while also presenting as smooth and attractive, the cladding is another feature that is worthy of mention. The tongue and groove will ensure the building lasts for a very long time indeed. 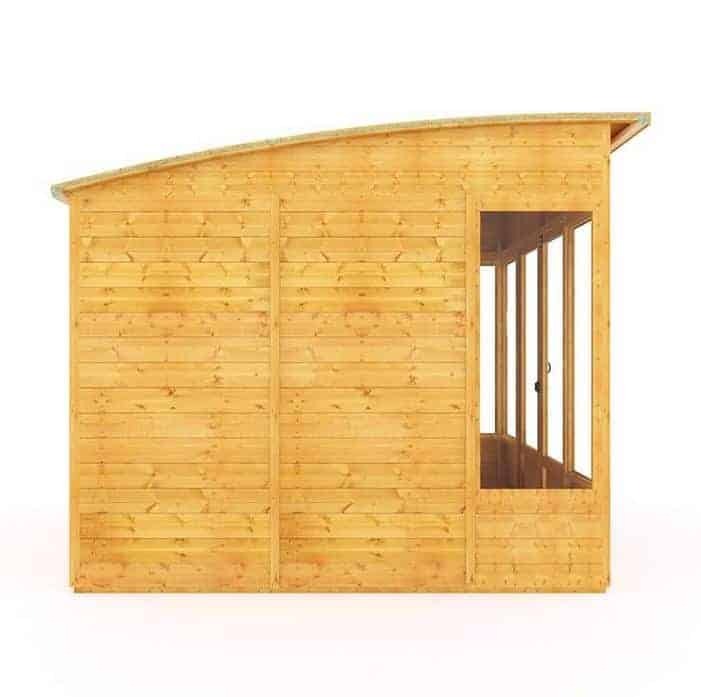 It works by interlocking panels tightly, so tight there is no join, and then the combined weight of the panels works to bring solidity to your building. We were a little bit mystified at the floor options here. We are talking a reasonably expensive building, one that will be fully deserving of care and attention. And then you get the option of giving the building a simple solid sheet floor. We say bypass that option and go for the tongue and groove flooring option that BillyOh offers. It is a little more expensive (not a lot) but it will pay off in the long run by providing you with a high quality floor that won’t bend or buckle. There is excellent news here. We always talk about the need for pre-treatment and BillyOh come up with the goods here, with a treatment applied at the factory. This is good for you because it cuts down heavily on the maintenance you would have to carry out with the unit. With this building you get four windows. While that may not sound like a lot for the price we do have to state that the windows are large and let in plenty of light. They are fixed though, and this is an issue for us. We would have liked to have seen at least one opening window.The reason? It’s a sunroom, and we would like to think that ventilation is made as easy as possible. The situation is rescued somewhat by a door width of 58.3 cm, which is ample room for anyone. But we were not overly impressed by the lack of an opening window. The windows are fixed, and are glazed with styrene. This makes for plenty of security. However, there is no locking system to speak of. And this is not covered by any optional extras either. 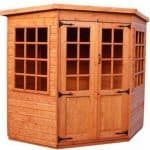 You can take the plunge and opt for shelving as an extra when you buy this building. And shelving would be a good idea as you use the sunroom for the purpose it was created for. Relaxing with shelves to place books on, for example, makes sense.The options here are comprehensive, and can cover the entire wall space almost. It is worth checking out as an extra. You can also choose the colour of the trim and the walls as part of the customisation process. We found the colours to be rather smart, and a great choice for anyone who wants a bit of personalization in the building. The tongue and groove makes a huge difference to any building, and here the same applies. Bear in mind the stuff is basically impenetrable with water, and you can see why it is becoming such a popular option. We can't fault that attractive roof either, and the water run off will prove to be invaluable. You have that all built in due to the tongue and groove and the roof. And with the pre-treatment being applied, your new building is very tough and built to last. 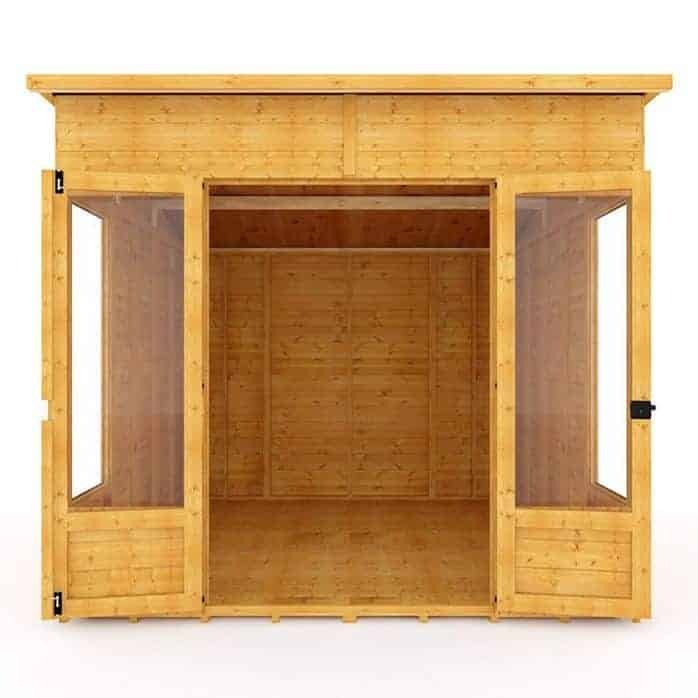 Apart from furniture, there probably isn't too much more you want to store in here. 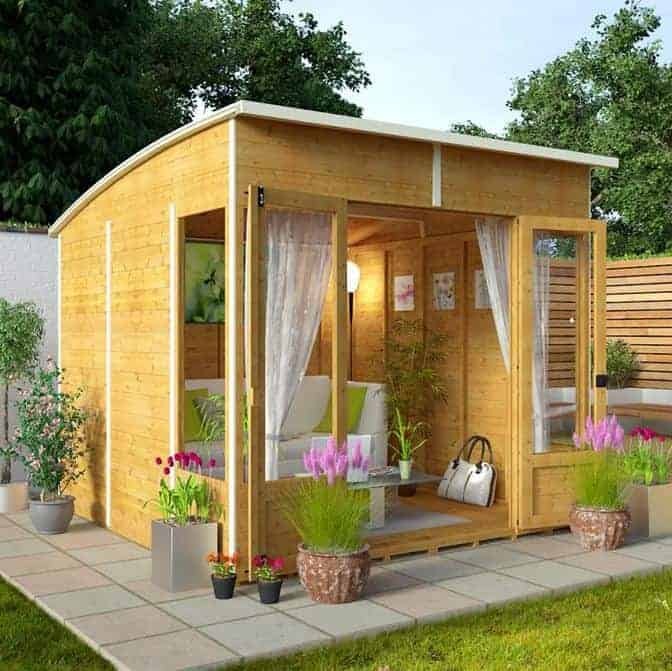 But the size is there for a good space that has huge potential. 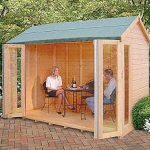 It goes together fairly well, but we would recommend that you have someone with you for the trickier bits, including that roof. We cannot get away from that lack of an opening window, which is precisely why we are pulling this down a little to the score above. It would have been the finishing touch. Final Thoughts: We can't say too much against this building because it is well made and it has some good features. We liked the fact you get pre-treatment and would make that part of the recommendation. However, why was there no opening window? This is a bit of a flaw in the design and, while it wouldn't stop us from buying it, it does affect our overall appreciation levels. Thanks for the review Melanie. I am sure this will help others decide if this is right for them. As Melanie pointed out. 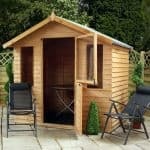 This summerhouse suffers from having no ventilation whatsoever. I’ve cut out 2 square holes and added vent covers, to aid the airflow and prevent the build up of damp, throughout the winter months. 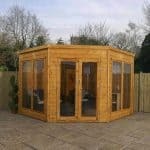 The roof felt sold with the summerhouse is good for 12 months max. It’s the cheapest of quality and starts to split and come away at the corners. The perspex window are very very fine too and susceptible to rattling and popping out of the housing in high winds.